The book's subtitle is a bit bold in saying: "Everything you ever wanted to know about middle-earth" but it certainly make a try at living up to that saying. 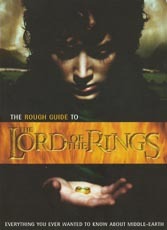 There are chapters covering: the origins of the stories, which includes much of the life and times of JRR Tolkien; the books themselves and their myths and interpretations; background to the making of the films; details on the characters; details on middle-earth, its culture, geography and languages; details about the movie locations; a chapter on memorabilia - both the books and the movies, including related websites; and a chaper that goes into how the books have inspired computer games, politics, environmental issues and music, among various issues. Some 130 B&W photos are included as well as sidebars and other ephemera. A very handy, compact companion book to take on your trip to New Zealand LOTR locations. 037 - Introduction: A rough guide to exactly why The Lord Of The Rings has become the best-read novel of the last century. 043 - The Origins: The life and times of JRR Tolkien, and how they led to the creation of his masterpiece. 109 - The Movie Trilogy: From printed page to movie screen - how Hollywood finally turned Tolkien's trilogy into a blockbuster movie. 149 - The Characters: Meet the good (most of the hobbits, Aragorn), the bad (Sauron) and the ugly (the orcs, the uruk-hai) inhabitants of Middle-earth. 185 - Middle-earth: A sightseeer's to the culture, geography and language of Tolkien's Middle-earth. 209 - The Locations: From South Africa to New Zealand via Birmingham: the locations which helped inspire and enrich The Lord Of The Rings. 241 - Ephemera: The world of The Lord Of The Rings and Tolkien memorabilia, from first editions to duvet covers and hobbit costumes. 273 - The Context: How Greenpeace, 1970s progressive rock, computers and Russian politics were touched by The Lord Of The Rings.